Q: Why should someone have his clothing custom made? A: There are many good reasons. Buying mass produced clothing is a compromise in every respect. It’s a terrible compromise of “fit” because pre-made suits, jackets, slacks, shirts are made for “average” shapes and sizes, to which few people conform. To the degree that someone varies from the “average”, it calls attention to their “minor flaws”! A shorter man with a big chest looks shorter in a jacket that is too long, intended for a taller man with the same chest size. (A “Short” jacket is often not short enough). A person with small hips or a flat seat, appears to have a flatter seat if the pants cut for a more round rear end, droop and sags under his or her rear. A jacket made for a person with “average” shoulders, worn by a man with more sloping shoulders results in folds and wrinkles down the back, exaggerating the slope of his shoulders, and so it goes. Another issue is “Value”. The compromise of “Value” is huge in buying off-the-rack. Moving merchandize through a distribution chain requires profits of double and triple for a manufacturer, a wholesaler and a retailer! To end up with a price point that stimulates sales, the quality has to be compromised dramatically. A product that sells for $1800 at retail, often costs only $200 to make! That is a 900% total markup! The biggest waste of all is the “time” taken in running back and forth to stores first to purchase, then to return to pick up alterations, and all to end up with a product that neither is well made, nor fits as it should. The “compromise” of one’s time and image, and what should be a long term investment in a good product is not to the consumer’s best interests. It tells the world instantly who you are! It projects where you stand in our social hierarchy. Nothing facilitates success faster than a carefully crafted image of success! People gravitate toward, want to get to know and quickly do business with people who are (or appear to be) successful. They decide immediately, within seconds whom they will or will not take into their world. Decisions are made 85% through “visual input”!. It’s not what you say, or even your credentials, as much as how you “appear”, that opens doors to new relationships, new clients, new referrals and new opportunities. 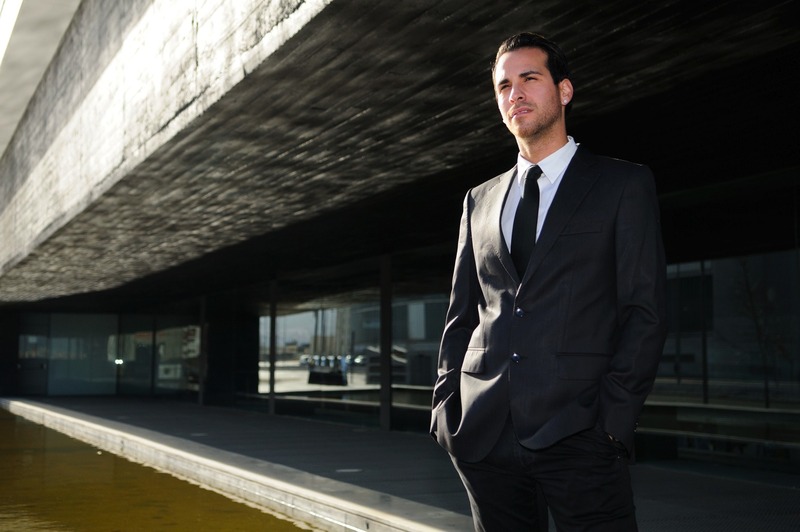 Perfect fitting clothing gives one the look of success more than any designer name of even the most expensive of suits. And perfect fitting clothing is exceedingly difficult to find in today’s mass production world! “True” custom clothing is best investment one can make in themselves! Q: What do you mean by “True Custom Clothing? A: Clothing that is made from each client’s individual pattern which has been made from scratch by a tailor who learned the art of translating one’s “shape”, “posture” and distribution of separate measurements into their own personal pattern, which might be compared to a person’s shadow cast upon the wall. Q: If a man already “has a tailor”, is their any reason for him to continue looking? A: It’s like having a “Financial Planner” but not having any idea whether than planner is great or terrible. Most men have no idea how their clothing should fit, or how to put themselves together. Just “having a tailor” is not enough. One needs to learn to know what to look for as it relates to their clothing: how it should fit, their best colors, how to determine how well something is made, and more. My seminars are designed to do that in one hour. Q: What makes your approach different than other people in the custom clothing business? A: Several good clients have told me that the “main reason” they come to me is the one benefit I never talk about. They like my taste. Even more than the superior fit, the timesaving service, they claim to love the way we put them together; the choice of their “style”, the “cut”, the colors, the combination of patterns, together with the clean, perfect fit. Q: So you see yourself as a “Stylist”? A: Yes, however , Stylists typically don’t have the experience or the passion I have for a perfect fit, because our society doesn’t offer it on a broad basis. While the putting together of styles, colors and patterns is all important, I still believe that the perfect “fit” of one’s clothes is fundamental to their image. It’s number One in importance! Q: What would you say to someone who is presently “Happy” with their source of clothing? A: “Loyalty” is an admirable quality. But loyalty is only appropriate when all things are “equal”. It’s “foolish” to be loyal to a lesser product at the same price. No one would pay for a Bentley and settle for a Buick. Both are nice cars but everyone knows there is a difference in “value”. The problem with custom tailoring is that no one is clear as to what makes one suit (or source of clothing) worth more than another! And, it’s not just the suit’s quality or even the “fit” but the expertise of the person you’re working with that produces a “mix” of superior results all at once in coordinating all the variables: proper color, the style, the fit, the quality, the taste level of putting all of the accessory colors and patterns together Timely service is important: how quickly it all comes together with perfect results. Most men don’t see the “compromise”. They don’t begin to understand a proper fit, beyond sleeve length, nor the quality of the construction. Many don’t have any imagination for the putting together of any colors or patterns. They limit themselves by over managing the process! A smart man knows when to seek out the right source, step out of the way and let someone else do what they do best! Finding the person who has put all of the “Elements” together and pulls it off perfectly every single time, is the challenge. My “Dress for Success talks focus on “The Elements of Dressing for Success” address these issues…helping to broaden the level of knowledge of potential clients in a matter of an hour or so. The seminars give someone a chance to “explore alternatives” without being uncomfortable in a one on one sales appointment. Q: Is a man’s best bet to go to a traditional “Tailor” who will make the suit himself? A: Not necessarily! Tailors are craftsmen, to be admired for sure, but nevertheless, craftsmen! If you were building a house would you start with the carpenter who was swinging the hammer and actually “building” the house? Of course not! You’d hire an architect who would implement your ideas, with his skills and suggestions, then contract with the actual “builders” who would build the house. Along the way, you might consult a decorator to deal with the aesthetics. “Tailors”, those who draft patterns, cut fabrics and/ or stitch them together are “craftsmen”, like carpenters. While they are excellent skilled workers, they don’t lean toward the “aesthetics”. My “in house” tailor of 25 years is a genius of a pattern maker and tailor. However, if I were to have him take your measurements, you’d end up with a completely different suit and you’d have a completely different look altogether in your suit than if I had taken your measurements, implemented my “formulas” for a perfect fit, then instructed him or my overseas workshop tailors” to make the suit to my specifications. Ten different tailors, all given the same measurements without the “formulas” would produce ten different fitting suits! Were to all take the measurements their own way, the suits would be even more extreme in the differences of fit! And, without our systems for consistency, every suit would require trial and error “fittings”! Q: How is is a new suit measured by you, going to be different from one measured or even by your tailor? A: I measure someone’s body with the way I want the end product to look on that client. A tailor measures someone less creatively, more straightforward. While I’m not a “tailor” per se and have never made a pattern, sewn a fabric, or sewn on a button,, I have an eye for line and form and an uncompromising pursuit of perfection. My goal is to deliver a first suit that is so transforming, it will make that individual look the best they ever have or ever will. Thereafter, once a suit fits perfectly every item thereafter will fit perfectly, ….even with extreme changes in “size”! A client can gain and lose 20, 30, even 50 lbs, and his or her pattern, (which reflects his “shape” and “relative” measurements) can be expanded or contracted in “size”, from one order to the next, over the phone, without need to come in for measurements or come in to try on or pick up completed clothing. Q: What do you mean “Relative “measurements. A: The “relative” width of his shoulders, compared to the standard width that would come with his chest size in an off-the-rack suit. His proper “rise” measurement (the depth of crotch) relative to the rise that would come with his ready made suit size, etc. Q: How can your suits fit better without “fittings” than a suit made by a tailor “with” fittings. How is that possible? A: My experience allows me to control the results, the exact fit of a suit without leaving any subjectivity to my tailors. I use their skill but insist that they decide how the suit will fit, not them. First of all, there are tailors who make clothing in the back room, starting by drawing around standard block patterns, and there are those that send the suits out to a factory. 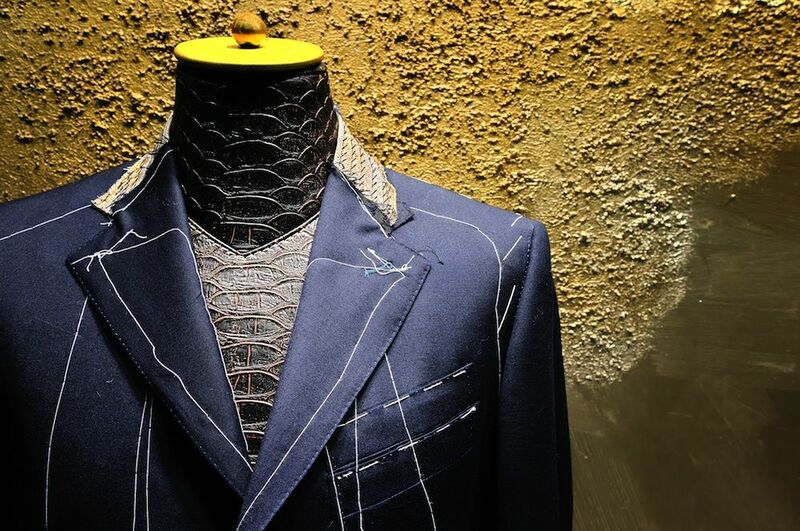 If the tailor cuts the suit himself, unless he is 75 or older, chances are he had access to standard patterns 50 years ago and is simply starting with a standard size and “adapting” or “altering” it throughout 2 or 3 fittings. Since standard patterns reflect “average” postures, the suit will never fit as well as if the pattern was made from scratch to address that client’s “shape” and unique measurements. “Fittings” are not necessary, if a tailor knows how to make a pattern for each client, particularly after the first suit has been made to fit properly. “Fittings” are a tailors chance to correct his mistakes while the client keeps coming back 2, 3 or 4 times, waiting often for months! Now, after 45 years making clothing, we have formulas to produce perfect fitting clothes and we adjust each client’s pattern for a new order, for any size or weight changes relative to the fit of the last order, or for a client who is bouncing around in weight, an earlier order, all of which we have on record. Every jacket or suit ever made has an order number inside with records that can reproduce the same result. 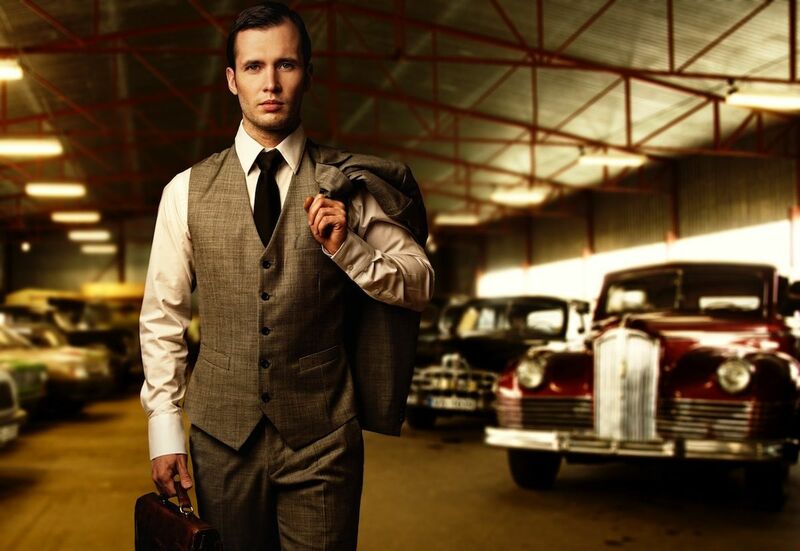 Q: Why wouldn’t every tailor’s suit be the same fit, if all the tailors are trained professionals? A. Tailoring is as much an “art” as a “science”. Tailors all vary in their approach and their talents. The “experience” of someone with thousands of custom suits to their credit, prepares them to produce a better result than someone in their first 5 or 10, or even 20 or 30 years of business. After watching what worked and what didn’t, we figured out ways to produce a perfect fit and systems to be able to repeat that same perfect fit. Not every Body type looks good in the same “cut” of suit. There are various shoulder lines and “silhouettes” of jackets that can flatter one’s strong points and hide their weak points. It’s why a costume designer is a separate person in the making of movies than the manufacturer who actually produces the clothing. They are separate talents. Q How might your suit fit differently than another tailors? “It’s going to fit differently”. “Can you tell me how it will fit differently”, he asked. I reminded him that in 3 weeks he would see his first suit but he continued to press, so I proceed to tell him the following: “This is a beautiful suit that fits you perfectly”! But you were measured by a “tailor” who made a suit to fit you, but not the kind of cut and fit that would make you look your best”! He asked me to be more specific” “Jim”, I said, “You work out twice a day! You’re built like a brick “phonebooth”. You’re like a Bull, thick with very sloping shoulders, a long trunk, relatively short legs. The tailor who measured you, by measuring your shoulders as he did, and cutting the shoulders as he allowed his factory to do, makes your shoulders appear more sloping, like a “coke bottle”! I’m going to measure, cut and pad your shoulders in a way that makes them look far less sloping. Also, I’ll get the armhole up slightly, narrow the sleeve. The jacket is too long and shortens your legs. If we get the crotch up higher, still comfortable, we can shorten the jacket and create a longer leg look. Your thighs are massive, but this tailor made the pant leg wider than necessary and too small at the bottom, so it stops and gathers around your ankle, rather than dropping down over your instep, and connecting to the floor. I can add two inches to the length of the pant leg with the right style and make you look taller and thinner in the process! Came the day three weeks later, I walked in with his first suit. He put it on, flipped on the light switch of his executive bathroom, and a stream of enthusiastic profanities flowed out of his mouth followed by his command to his personal assistant to get his checkbook. He wrote a check for $35,000 to purchase a gift of a $5,000 suit for his seven best friends who were also using his Italian tailor! Stories can be boring, but sometimes there is a need for people to understand the dynamics of something that they might not otherwise have had an opportunity to understand. The lesson of this story is twofold: If a craftsman doesn’t see his “outcome” (whether a house or a man in a suit) as the best it can possibly be, it can never come true. Secondly, The Italian tailor was working under a handicap because his factory, like 95% of “factories” today, only worked from standard “block” patterns. The tailor didn’t have the open ended system to be able to give the client the shoulder width, cut or slope that didn’t correspond to his chest size. Nor could he give him the crotch depth that didn’t correspond to his chest size. His “limitations” of working in a “made-to-measure” system were imposed on him. Fifty years ago, young tailors in the western world had access to standard block patterns, which meant they didn’t have to follow their father and grandfather’s career path,’ having to spend 15 years as someone’s “apprentice” to learn the art of pattern making and tailoring. But sadly, there was a real compromise in the new approach. Today, 95% of the suits represented as “custom” are a shortcut form. Even Savile Row in London, tailors in Italy, New York, Canada, all have seen the better days of tailoring go before them. Q. So, where do you make your suits. A: We’ve had our own workshop in Hong Kong for 43 of our 45 years in business. As we figured out how to instruct the tailors to give us a good fit, that was not a problem, but in the early days, the “workmanship” and quality left a lot to be desired. It wasn’t until we began taking our Italian tailor to Hong Kong with us regularly that our quality really took a leap, to equal the finest quality suits from anywhere in the world, and a much better fit! Q: Is it true that you have a client that ordered 800 suits in one year? A: Yes. He’s a well known Entrepreneur and had been a client for some 15 years. One day while picking up his largest order to date (about $100,000) he said, “Greg, I’m thinking about ordering a suit for every day of the years. What do you think?” To which I replied, “Gosh, a man like you should never wear the same suit twice”! He looked up at the ceiling of my showroom and repeated softly two or three times, ….”never wear the same suit twice”. Hmm. It took about six months. Two or three days a week he came in and ordered about 50 suits at a time. He kept us busy but here is the amazing part of the story. 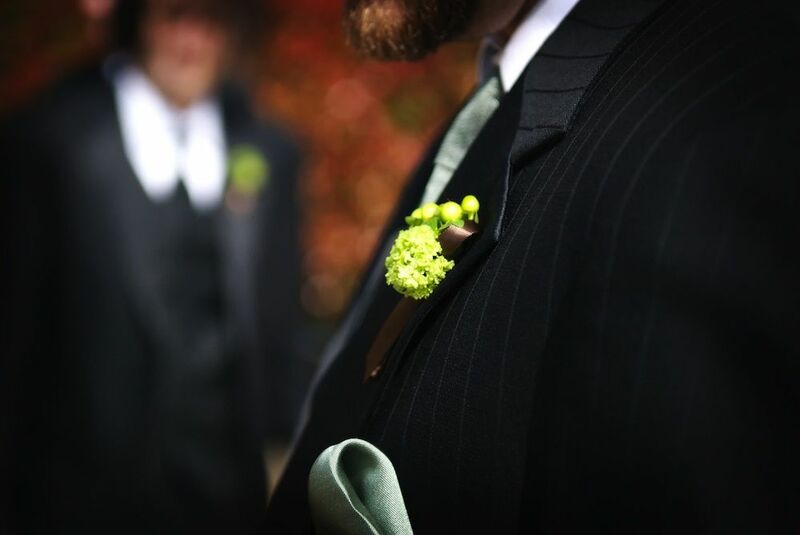 Not a single suit required a single alteration. Each suit was different from the other in terms of styling, no two suits exactly alike. I’d design and write orders until 2:00 in the morning, not knowing if there would be 50 more suits the next day. I couldn’t fall behind. There were no fittings, no alterations. His driver would come pick up 50 suits at a time. Each one fit perfectly, due to our long established formulas and inspection systems. His pattern reproduced the same fit over and over. He’s been a client now for over 30 years and have varied in weight by more than 40 or 50 lbs. At the end of this buying cycle, he asked me to come help him figure out where to put all of these suits. Every closet in every bedroom was packed with suits. We decided to convert his attic of his magnificent house, to a closet. As $250,000 worth of construction was completed, I was helping him to organize his closet and came across a suit with another tailor’s label, then another, then another. He’d been my client for 15 years at that point so I was surprised but said, “Where’d you get all these other tailor’s suits”? To which he replied: “Greg, you don’t think I’d order 800 suits without making sure I was going to the very best tailor, do you?. Q: Why do you promote your Wardrobe Plan so much? A: Because I see it work miracles for those who’ve learned to use it, with all of it’s savings and bonuses! Very few people ever become well dressed. Even those who do, rarely “continue” to be well dressed throughout their career. Most people have a good 5 or 10 year “run” of their 40 year career and they spend money on nice clothes while their making money, then quit either when they feel they have enough, or business slows down. They then spend the next 5 years wearing out all of their nice clothes, then can’t afford to replace an entire wardrobe of top quality clothing, so they begin to compromise, buying a suit or two to get by, then buying 3 or 4 on sale, then they’re back to where they started from before ever meeting us. They often change weight and are comparing 5 or 10 year old suits that fit 10 years ago, to new off the rack suits of a newer style, and they lose site of whether it fits as it should….because it’s more comfortable and has newer style elements than the suits of yesteryear. Q: How could they have avoided that? A: Had they just “slowed down” their purchases, for example dropped from $500 a month to $200 or from $250 a month to $100, they would have continued to have moved forward and had a budget to continue to freshen up their clothes, or accumulated enough to buy one suit a year, to reduce the wear of the existing clothes and at the same time, allowed us to update their new size and new styling feature; the waist button location, the shoulder width and style, the width of the pant leg, not to mention more minor features like subtle changes in lapel width or vent style. They also could have captured in addition to savings of 15% or so, additional “bonus” savings of an additional 17% or 18%, which would have reduced their overall all costs by 1/3rd, and allowed them to build on their existing wardrobe before it all wore out and needed replacing. Q. How long should a suit last? A: If it’s well made and rotated with other clothes so that it’s not worn and cleaned too frequently, a suit can look brand new when it’s 30 years old or more! I often will purposely make one of my “Dress for Success” talks in a suit that was made 30 to 35 years ago. I’ll ask my audience to guess the age of the suit, then show them the label inside, marking the date of making: often 30 to 35 years ago! It’s a lifelong possession, if it’s taken good care of and keeps enough company of other suits in the closet! Q: How do you maintain relationships with your clients across the country when they gain and lose weight. Don’t you need to see them? A: As indicated earlier, our file on each client contains a copy of each order with a fabric swatch, all of the details of that order and an inspection of all of the measurements of that very suit, attached. There is a corresponding order number in the client’s suit that matches our numbered order form. In terms of the taking of each order, we have several hundred pre-swatched photo/swatch sheets and a “menu” of those sheets. We often take orders by phone in less than 5 minutes, discussing swatches on numbered sheets that we’ve mailed or emailed to clients. 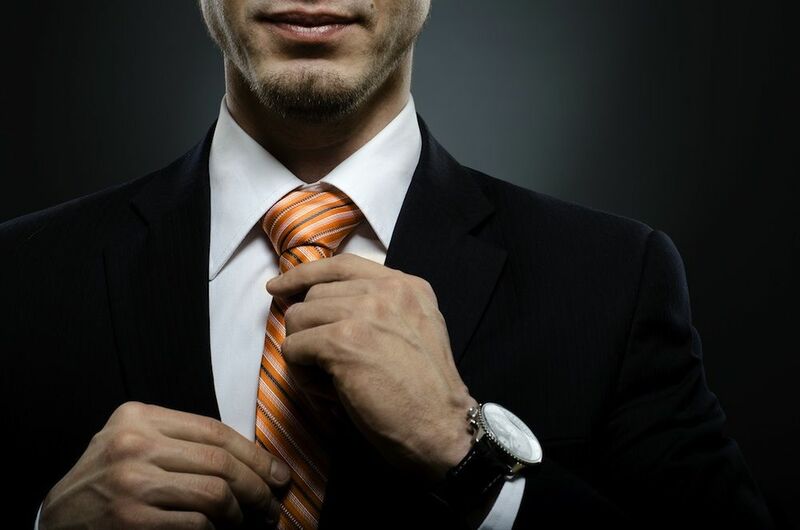 Within 3 or 4 weeks, completed orders are sent directly to the client often with shirts and ties which the client has authorized us to select. People seem to love our taste and it’s rare that anyone doesn’t like our selections. We’ll often ask for a little guidance in advance. Q: How do you know when or how often to contact a client? A: That is our biggest frustration and the entire rationale behind the Wardrobe Plan Program. One client will want to purchase 3 or 4 times a year and another will go 2 or 3 years between purchases. The “Plan” has provisions for all of that and each client agrees to a “cycle”, and is contacted on a schedule, but has the option to postpone, or combine budgets. The client isn’t bothered with phone calls too frequently, nor is he overlooked as we’re trying not to “harass” him or her. Many clients have participated in our Wardrobe Plan Program for their entire careers, 30 to 35 years or more. It literally works “miracles” and is more flexible than most people think. Those who are afraid to make a commitment usually slip farther and farther behind, then “away”, while those that agree to a “plan” move forward with new clothes, and more and more new ideas for clothes, along with great savings and an easy, flexible monthly amount that can change from year to year. Q: What determines the “Quality” of your clothes? A: All of our clothes are made in our own workshop, cut from each client’s individual pattern and made on the lap of an individual tailor. The factors that determine the price of our suits are the fabrics and the amount of hand labor and workmanship that goes into each suit. We’ve divided our products into three groups, “Silver”, “Gold” and “Platinum”. The handwork and fabrics in the Platinum line are the finest that money can buy. The “Gold” line has only slightly less handwork, and the fabrics are still fine English and Italian woolens. Our “Silver” line gives a client the same excellent fit but with lesser time in making and a narrower range of fine fabrics often purchased in quantity in order to reduce costs. 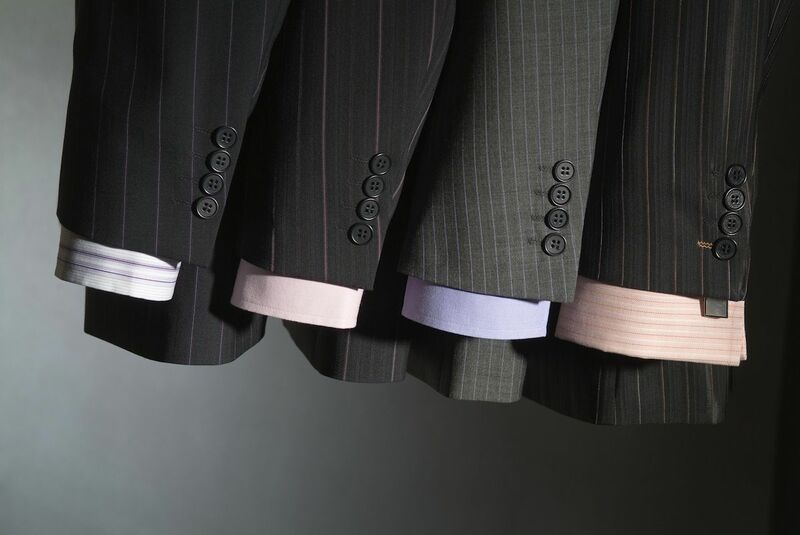 In a general sense, a client can reduce costs by stepping down a notch, or can maintain the quality but reduce “average” costs by being on our Wardrobe Plan. In other words, A “Platinum” suit can “average” the price of a “Gold” suit on the Wardrobe Plan Program. Q: Say a few words about your Wardrobe Plan Program. A: It addresses the building and maintenance of one’s image and wardrobe as an on going “process”, rather than an “event” driven experience when the “need” arises. “Need” often implies replacing something or adding new fashionable styles. I view the “fashion” business in large part as “manipulative”, more to the store’s and manufacturer’s advantage than the consumers. I’ve had candid conversation with the people running the largest department stores nationwide who are quick to admit they want people to wear out and replace their wardrobe as frequently as possible. The introduction of new ideas that makes old ideas look obsolete, combined with the inferior making of 95% of the clothing sold, makes for an industry that thrives on providing a lack of long term value. I prefer “classically styled”, well made clothing that becomes part of one’s lifetime collection of personal clothing. The Wardrobe Plan builds a wardrobe of clothing for all the occasions of one’s lifestyle and makes it large enough so that no one item is over worn and over cleaned to the point where it should ever require replacing. The “Plan” offers many budgets and is very flexible and holds with it some impressive savings.